Mistrust is the result of leaders and followers who do not bother to confirm their assumptions about a given situation before either or both take action. Here is an example. A production line supervisor needed some routine information from Larry who was working nearby at his station. The supervisor walked over to Larry and said, “I need to talk to you when you have a moment.” Assuming Larry would stop by after work, the supervisor was startled to find Larry following him back to the office leaving his co-workers to cope with the resulting chaos on the assembly line. So, who is at fault here: the supervisor for not providing a time frame or Larry for assuming he should stop working and come right now? 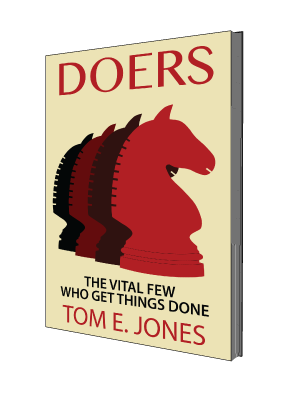 Doers have no trouble realizing when the leaders intentions are not clear. They know because they are matching what is said against what they already know to see if there is a good fit. So, when they hear something that makes no sense or is out of context, rather than act upon an assumption they admit their confusion and seek clarification. Underachievers may also sense something is not right, but instead of letting their leader know, they simply whine and complain to each other about their assumptions. I once overheard an employee in the break room complaining that his boss had a plan for the upcoming merger but only shared it with the “brown nosers.” This clueless chap declared that he would not kiss anybody’s backside just to find out what was happening. His bluster was rewarded with a round of cheers. Later that day, I was working with these same folks in a communication seminar. After letting them know what I had overheard in the break room earlier, I challenged them to tell me why their boss would share such critical information with some and not with others. The same whiner from the break room suggested there might not be any reason, other than the fact their boss was a jerk. When the laughter subsided, I acknowledged that possibility. But even if it were true, I suggested that as conscientious followers they cannot let working for a jerk keep them from obtaining information that will help them do a better job. It took a while, but most of them agreed their leader was not intentionally hiding information from them; he was just unaware of what they needed to know. His inability to figure out what to share and how best to communicate it was the source of their mistrust. We spent the remainder of that session defining ways they could avoid making assumptions and seek clarification instead.